The drive from Valdez to Tok was a 'head down, get on with it' kind of drive. I woke up in a cold drizzle, the clouds were still hanging around the mountains and I couldn't think of much reason to hang around much longer. So I hit the road shortly after waking up and drove. Only as I exited the mountains did the cloud veil begin to lift and I could peak some clouds (see what I did there?). It was pretty evident that I was missing a lot with the clouds being so low. 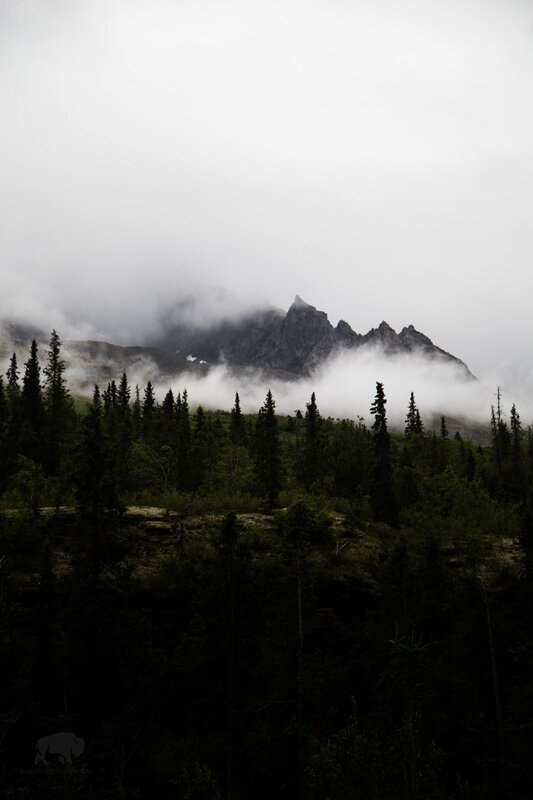 After the mountains comes the foothills then the Alaskan interior. 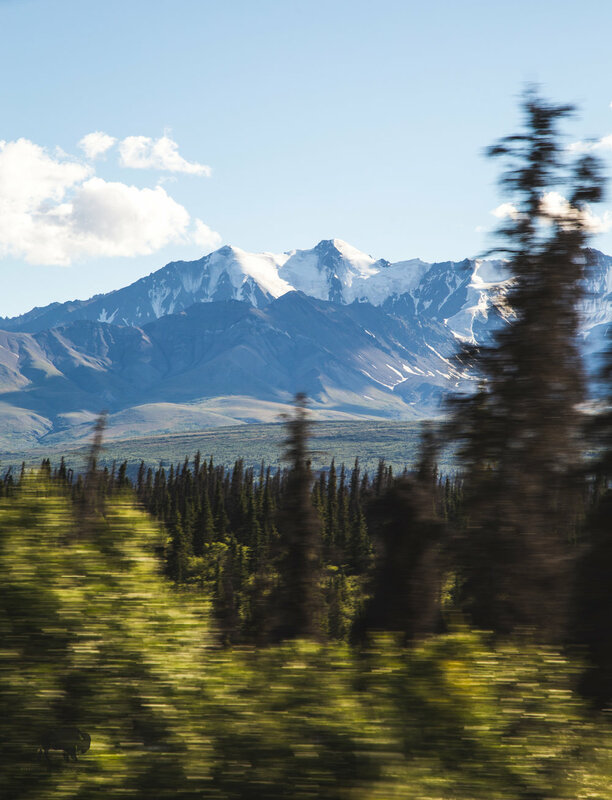 The drive is beautiful as you drive parallel to the coastal mountains for a good long time, but eventually you drive deeper into the interior and the mountains become smaller and the trees seemingly more numerous. 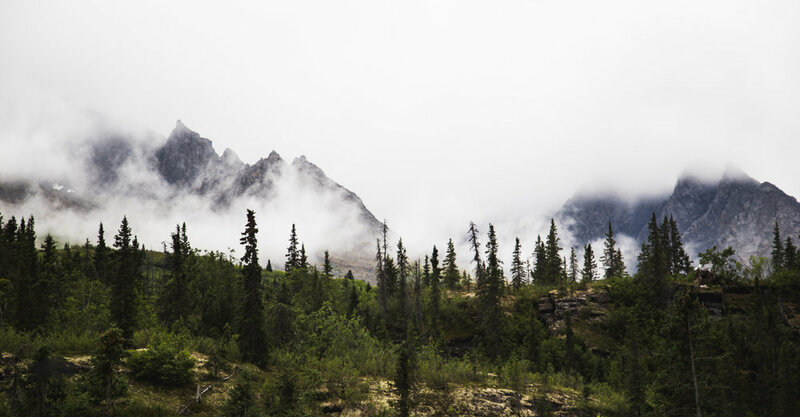 Peaks showing through the mist, the best visuals I got of the surrounding mountains on the way in and out of Valdez. Look at the price of gas! 1.45/ GAL!!! In my head the drive doesn't seem that long, but maybe that's because I am so used to long drives; the drive was about 6 hours at my usual rate of speed. As I pulled into Tok I stopped off at the local liquor store, bought myself one of my favorite beers (Deschutes, Mirror Pond Pale Ale) then drove 12 miles out of town to my little lakeside resort spot just off the highway. There was a small cloud dropping some rain but the temperature had risen at least 12*C from where it was in Valdez and I was able to get myself into the lake for a bath. Feeling clean I made myself some dinner, drank my beer and listened to some tunes while reading my book, it was a nice change from the cold and wet of the coast. I was joined by another European vehicle, a high top sprinter, but they didn't seem interested in chatting so I left them alone. 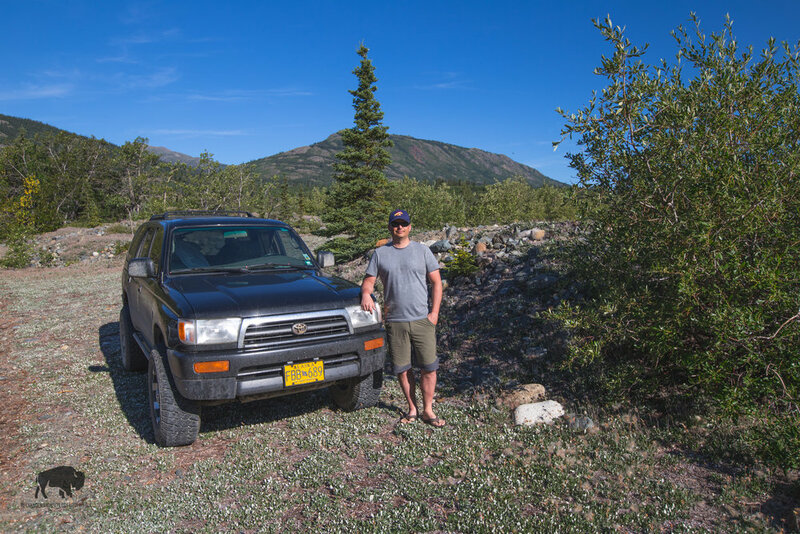 The next morning I drove back through Tok, filled up Turbo and struck out for the Yukon border. I drove all day. 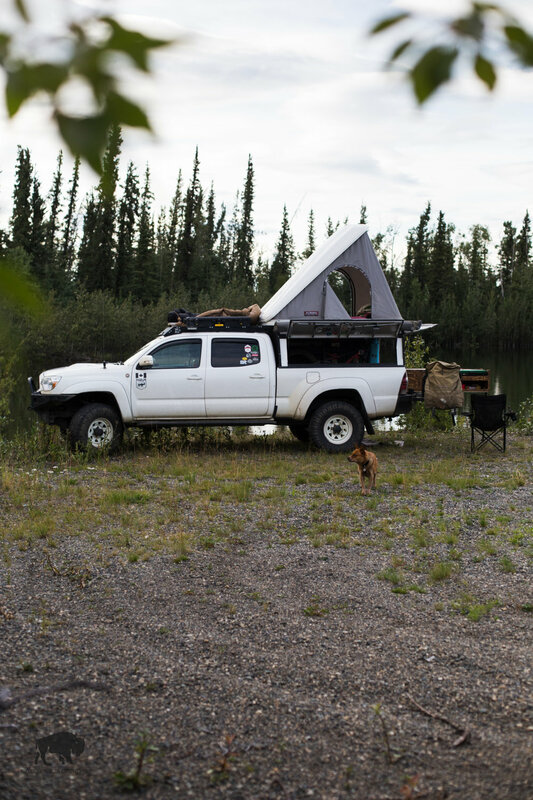 Later that night I set up camp beside the Takhini River just outside of Whitehorse. Sometimes I hate how I get into this mode of egress and feel the need to get back to somewhere, I think it's a problem of destination travel and me, to truly enjoy myself 100% I can't allow myself to have a destination. 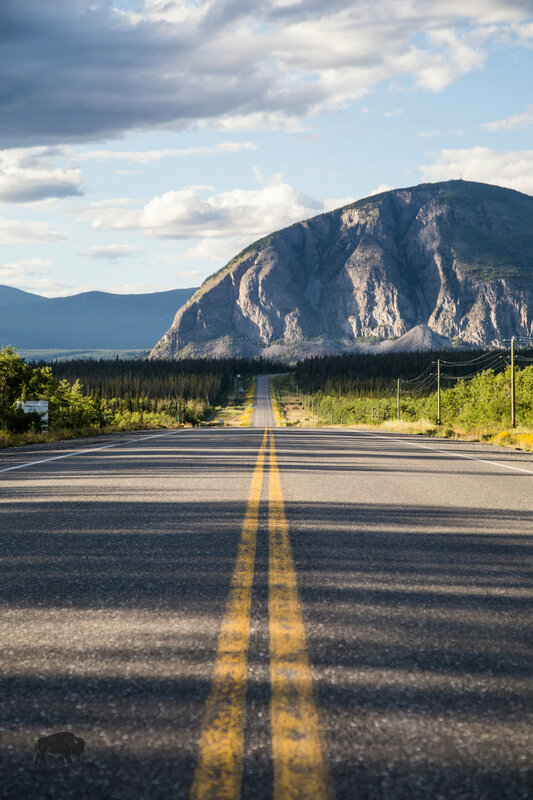 The drive South from the Yukon/ Alaska border is absolutely stunning, it happens to be an area of the Yukon that I distinctly remember from my first trip up North, unfortunately I blasted right through it. I find that vehicle travel is a constant classroom setting where you find out all about the things you shouldn't be doing, one of them being rushing yourself. Good bye Alaska! I'll be back one day! 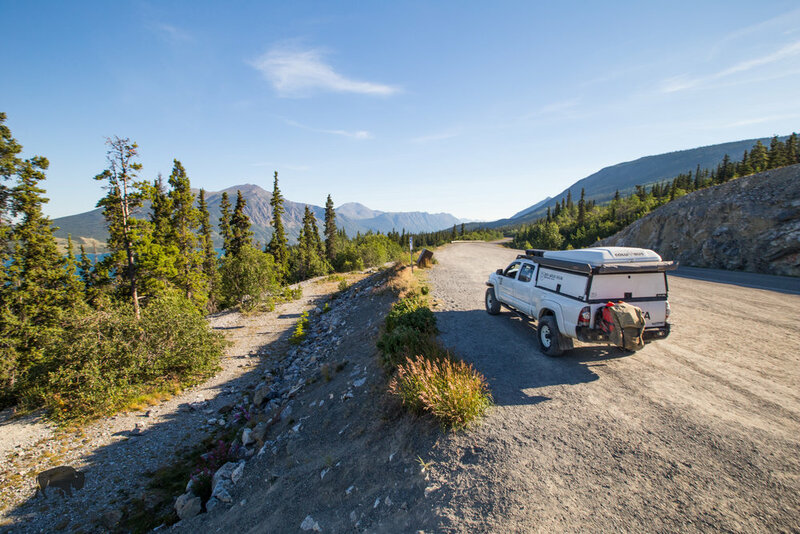 The Kluane Lake region of the Alaska highway offers up some pretty incredible views. Arriving back in Whitehorse I attended to the usual grocery/ supply restock then headed out towards Grey Mountain...but not to camp, hiking was on my mind this time. It was my plan after my last few days of rapid travel to slow down a little and stay a while. I was driving up the Grey Mountain service road when I spotted three guys just getting out of their van. As I approached them all three of them stuck thumbs out, what a lazy bunch! I slowed down to a stop and they call came over to my open windows. It's pretty obvious as you approach my truck that there's not a whole lot of room inside and I watched as their faces dropped; luckily for them though, I have sliders and a roof rack. I invited the trio to hang on and then proceeded to ferry them to the top of the mountain. I cranked Sultans of Swing by Dire Straits as we drove and received many smiles from other hikers as we passed them. At the top we introduced ourselves. I had picked up Paul from San Francisco, Dave from the Netherlands and Eddie from Minnesota...kind of an eclectic bunch. Paul and Dave had met years ago on another adventure then reunited in San Francisco to begin their journey to Alaska, Eddie was traveling by motorcycle and had met Paul and Dave a day or so earlier and had been hanging out with them since. The three of them left on their hike while I ate a quick lunch then caught up with them later. What started out as just a ride up the mountain became a dip in the lake, a big dinner with beers and whiskey then breakfast the next morning. It was a great time hanging out with more random travelers and a refreshing change from the solitude I had experienced for the four days previous. 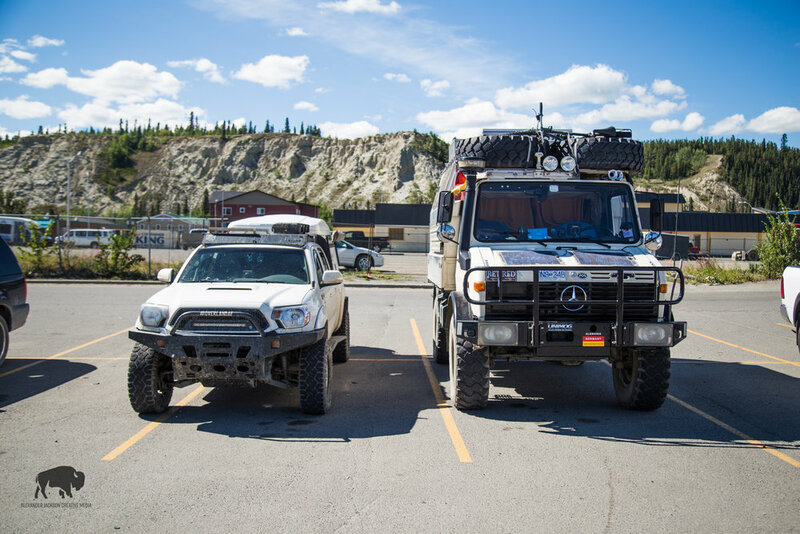 #rigenvy the guy that owns this unimog is from South Africa and lives part time in the Yukon and part time down South. He hunts and fishes...that's all he told me. Eddie on the left, Paul in the middle and Dave on the right. We ate pasta. I spent the remainder of the day hanging out and riding mountain bikes with another guy, Brodie, who I had met the night before. We hit up mountain bike trails on the West side of Whitehorse then later went to the lake and grabbed dinner at Big Bear Donair in town. As Brodie was also traveling South we decided to reunite in Carcross to ride bikes there. Let me say, Carcross is a pretty fantastic place to hang out. The small town at one point had virtually no industry and no tourism sector until some young kids got a government grant to build bike trails. Now it's a really legit mountain biking destination in the Yukon. In addition, there's a lake that has great opportunity for kite boarding and wind surfing. There's a place called the Carcross desert and they have an old train that leaves from the downtown and delivers tourists to Skagway, AK! The Carcross Desert. All this sand was blown here by the high winds coming off the lake. One of the earlier trains to take passengers to Skagway. Brodie and I rode for about 8 hours in Carcross. The day before we had planned out our route which would take us on every single black diamond trail on the mountain, which I ended up accomplishing and I had a blast doing it. We camped both nights in a gravel pit just outside of town. Carcross gets an A+ from me! Our gravel pit camp spot. Another win for gravel pits. Mr Brodie and his 4runner. Finishing off in Carcross I pack up and continue South towards the interior of BC.